You would think that being with friends and family on furlough in the U.S. should be a time of rest and relaxation after living and working overseas. Instead, I find myself waking with tension in my neck and a stress headache most mornings. Why? Because of the idols of my heart. I do love talking about what God is doing in Buundo Village, Uganda. I love the people there; I want you to be praying for my friends in Uganda. But when I am done talking about God's work, I slip back into my fears. What do these people think of me? Do they think our house is too big since we love next to a mud hut? Do they think we are being wise in the way we are investing their resources? I struggle daily with the decisions about how to best minister to those around us in a way that is "helping rather than hurting." So many decisions in ministry are unclear. They require lots of prayer and working with our Ugandan friends and talking with our team to figure out the best way to show the love of Jesus. Then in 30 minutes, I try to sum up all that we have been doing and deciding and praying about and struggling with for 2 years. When I leave these opportunities sometimes I am encouraged, remembering my neighbors and the kids in Uganda and how I love them and want them to know the love of Jesus. Sometimes I am anxious, worried that some of you will second guess our ministry decisions. It is wonderful that there are books and articles about using wisdom and considering long term economic consequences when making decisions about how to help people in need. It can be almost paralyzing at times though. And when you combine my love for my neighbors in Uganda with a sincere desire to be responsible and wise in the way we help, along with my fear of other people's opinions of me, it can lead to a lot of anxiety. I am convinced that this not the way Jesus wants me to live. And in Uganda, I do not struggle as much about what others think of me. So why am I so consumed with what you think of me? Because I have always struggled with looking to other people's approval for my identity. But now I have an added struggle. We live on support. If you don't like me or my ministry, you might choose not to financially support the work we are doing. Of course people have to give their money to the things they want to support. There are so many good choices of what to support. We have been so blessed by many of you and your financial support for our ministry. Thank you! But my "control freak" tendencies still lead to anxiety over what will happen if everyone stops supporting us and our ministry. As I write about my idols of control and approval, I realize that God graciously has put me in a place in life where I cannot find comfort in those things. Only He can bring peace to my anxious heart. Since we have been back in the U.S. I have been reading this great book. When you let go of the things that you have let define you all of your life, you will not be left with nothing. The story of redemption and healing is that Jesus came to exchange my not-good-enough with his better-than-I-could-ever-imagine. He came to trade my life for his, my weak for his strong, my ashes for his beauty. He longs for us to receive the gift of himself. God is graciously teaching me to depend on Him, rather than living in fear and anxiety about what you think and if you are going to support our ministry. Slowly, slowly as they say in Uganda. These idols are lifelong struggles, and reading a book or memorizing a passage of Scripture does not immediately fix me. But it is good for me to remember that Jesus has already made me right with God through his work. I want to learn to rest in that. 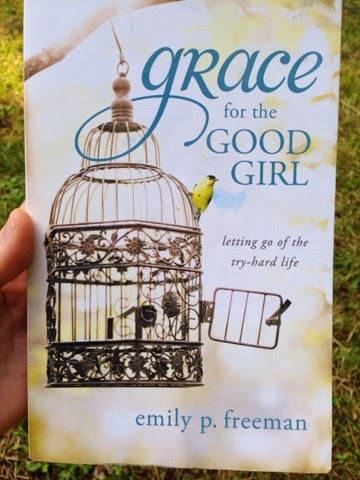 Emily Freeman often refers to Colossians 3:15, "And let the peace of Christ rule in your hearts, to which indeed you were called in one body. And be thankful." Many people ask how they can help or pray for us. For me, my greatest need is to let the peace of Christ rule in my heart, rather than my desires for approval or control. Please pray that I will grow in my ability to rest in what Jesus has done, letting his peace rule.